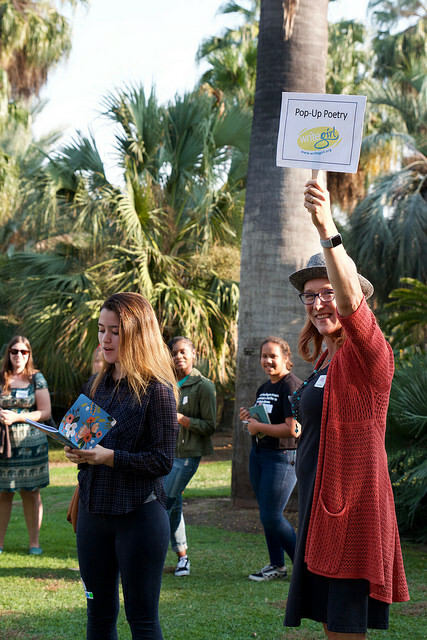 The Huntington Gardens was teeming with more than 230 women writers and teen girls at the WriteGirl Season 18 Mentee Welcome Day on Saturday, November 10. The day included writing activities, mentor and mentee matching, and opportunities to find inspiration in the gardens and museums. Girls got creative with fun writing prompts, such as a girl empowerment table featuring career-oriented Barbie dolls. 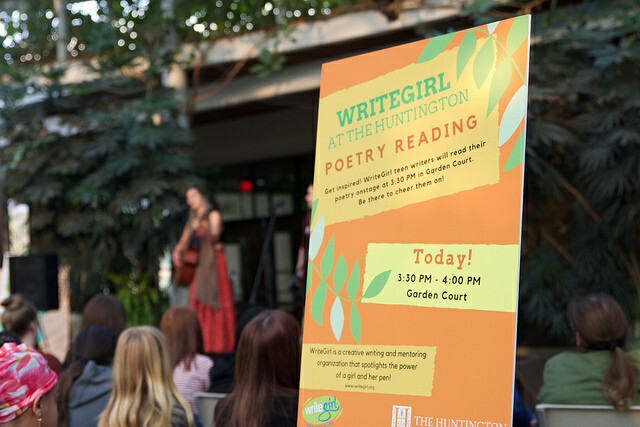 The girls also went into the gardens to perform in “Poetry Pop-Ups,” sharing their original poetry and prose as part of The Huntington’s Family Day. Visitors also were treated to a live poetry reading in the afternoon, followed by WriteGirl’s traditional and well-loved “Soapbox,” which gives girls a chance to rant or rave for 30 seconds about anything on their minds. As southern California reeled from wildfires and the Thousand Oaks mass shooting. attendees took comfort in being with like-minded writers and friends. Sky, a tenth-grader starting her second year as a mentee and working on a novel, echoed Taylor’s sentiment. “My favorite thing is meeting people who are like me, who have my weaknesses and share my flaws,” she said.